Hi Yall!! Toward the end of 2010 I discovered a challenge that intrigued me. The magic words were.... "Participating in my monthly blog challenges is easy. You don't have to belong to a specific forum or gallery. You don't even have to use one of my digital kits!" I admit sometimes I get really fed up with all the different forums & all their different & nit-picky rules. But this is coming from a decorative painter who has never had to deal with anything like that :) It is really a effort for me to figure out the credits, which site can & cannot be shared (especially if you have collected freebies). I have read many ways to do this while you are creating a page, & of course when do I remember this? When I go to add my page to a gallery. Dingy me!!! 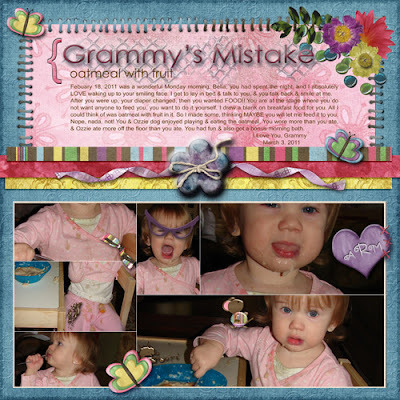 This site is by designer Jenn Reed, & I have to say that she has been so sweet to me. Here is the site for the March challenge. Jenn has provided a free template for you to use, and all she asks of you is to post a link to your layout, & she gives you a wonderful participation freebie! 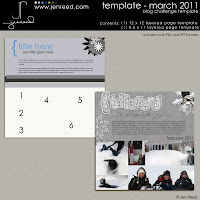 Here is the page I created from Ms. Jenn's template. I learned so much while working on this... & I think I had way to much fun playing with it! I think you can click on the pic & it will be larger. TEXT: February 18. 2011 was a wonderful Monday morning. Bella, you had spent the night, and I absolutely LOVE waking up to your smiling face. I get to lay in bed & talk to you, & you talk back & smile at me. After you were up, your diaper changed, then you wanted FOOD!! You are at the stage where you do not want anyone to feed you, you want to do it yourself. I drew a blank on breakfast food for you. All I could think of was oatmeal with fruit in it. So I made some, thinking MAYBE you will let me feed it to you. Nope, nada, not! You & Ozzie dog enjoyed playing & eating the oatmeal. You wore more than you ate,, & Ozzie ate more off the floor than you ate. You had fun & also got a bonus morning bath.